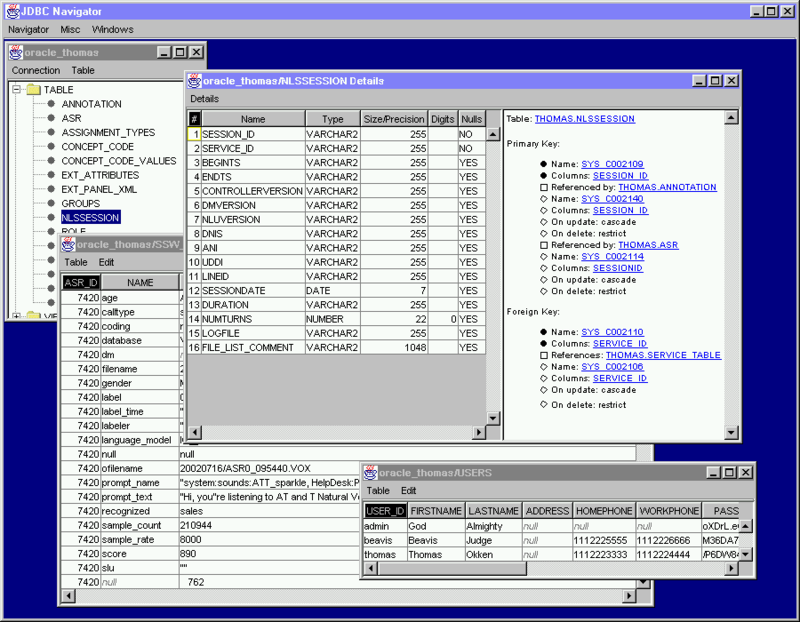 JDBC Navigator is a free database browser and editor. 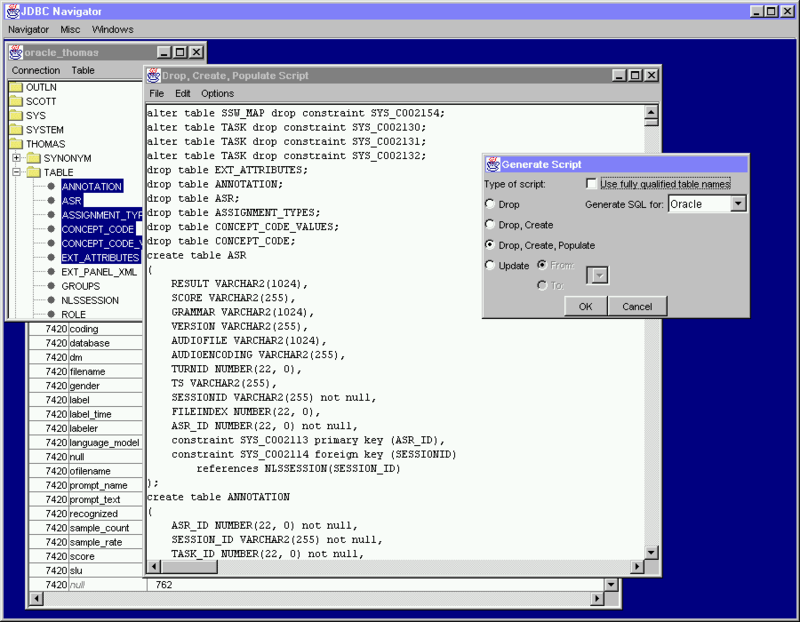 It lets you open JDBC database connections, browse schemas and tables, traverse relations by finding rows referencing a row's primary key, traverse relations by finding rows referenced by a row's foreign keys, edit table data (inserting new rows, and editing or deleting existing rows). When you edit two or more related tables, JDBC Navigator will automatically commit all edits in the right order so as not to violate any constraints at any time. 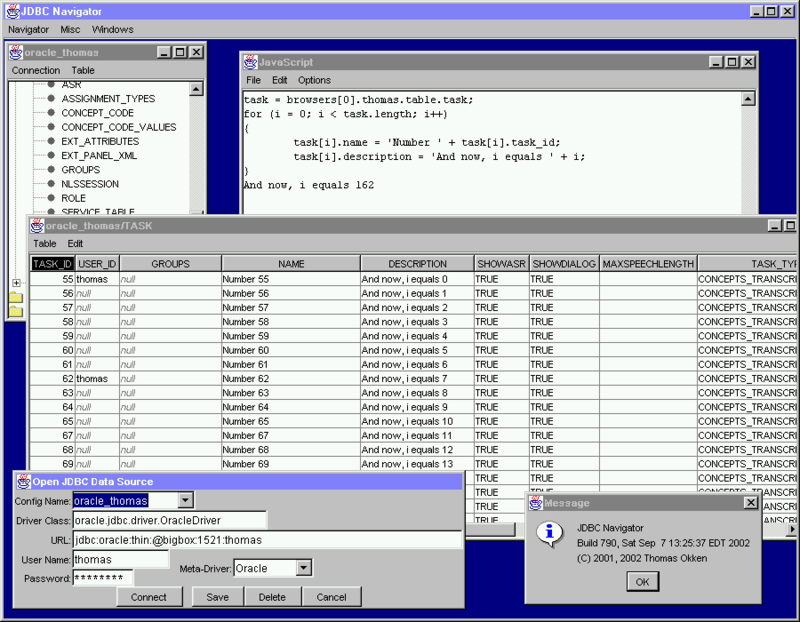 JDBC Navigator runs interactive queries and table loading operations in the background, so the application stays responsive while the query is in progress; you can pause or cancel an incomplete query at any time, and you can also edit incompletely-loaded tables without having to wait for the query to finish. 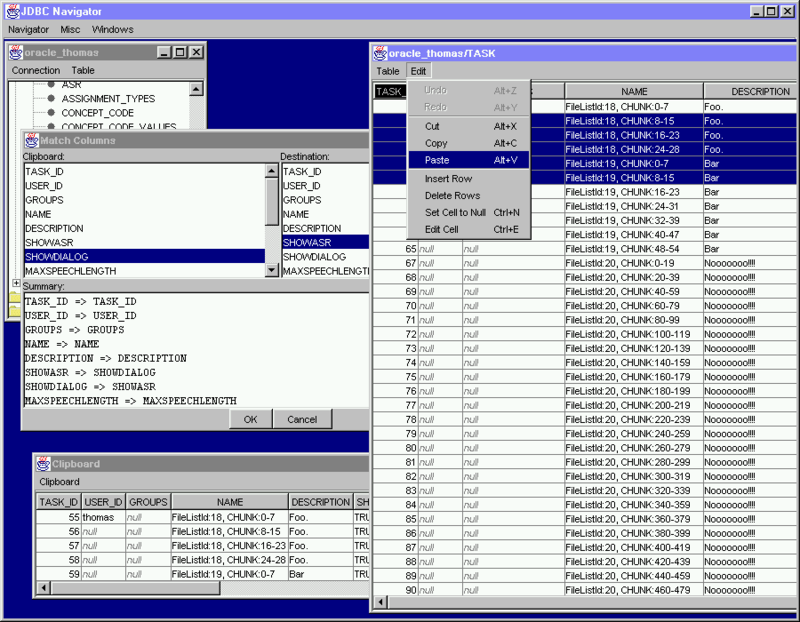 You can copy and paste rows between tables; when you perform the paste operation, you can specify how to map the source table's columns to the destination's. 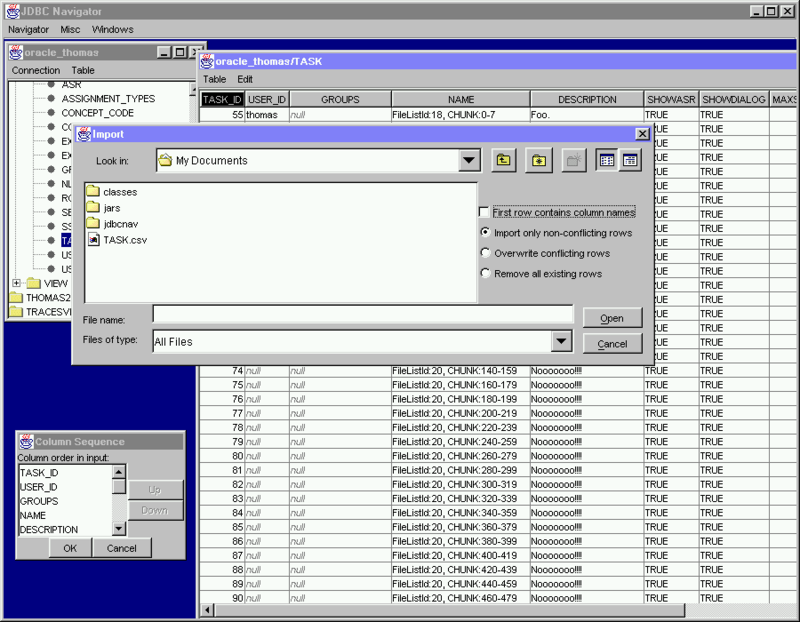 You can also save the contents of a table to a CSV file, which you can import into Microsoft Excel or other spreadsheet programs, and you can import CSV files into a table; when you perform the import, you can specify how to map the file's columns to the table's. You can create snapshots of tables or sets of tables, and you can save those snapshots to disk. Snapshots act like read-only databases; you can browse them just like a regular JDBC connection. You can compare two databases, and generate SQL scripts that will transform one database into the other (as long as they have identical table structures), or generate scripts that will re-create a schema from scratch. You can use these scripts as a platform-neutral way of copying tables from one database to another, assuming that the target database has a facility to run SQL scripts. You can also open a SQL window where you can interactively type SQL statements, rather like a terminal, except the window is also a text editor so you can easily tweak your statements and rerun them, and save them to disk so you can reuse them later. Compatibility: JDBC Navigator supports DB2, Derby, MySQL, Oracle, PostgreSQL, SmallSQL, and Transbase. In addition to this, you will need JDBC drivers for your databases. These should be provided by your RDBMS vendor. For Oracle, the file to look for is called classes12.zip, classes12.jar, or ojdbc14.jar. Did I mention JDBC Navigator is a Java application? You will need Java to run this thing; Sun's JDK or JRE, version 1.5 or later, will do the job. Alternatively, you may also be able to launch JDBC Navigator by simply double-clicking the jdbcnav.jar icon in the Windows Explorer or Macintosh Finder. Before opening any database connections, you will have to tell JDBC Navigator how to find your JDBC drivers. To do this, select Preferences from the Navigator menu, and add the drivers' zip or jar files to the Class Path list. This version of JDBC Navigator (build 2716, dated 23 February 2019) is available free-as-in-speech (GNU Copyleft). You can download the source code (jdbcnav.tgz) and tinker with it yourself if you wish. Questions? Comments? Suggestions? Bug reports? Contact me, Thomas Okken, at thomasokken@gmail.com. 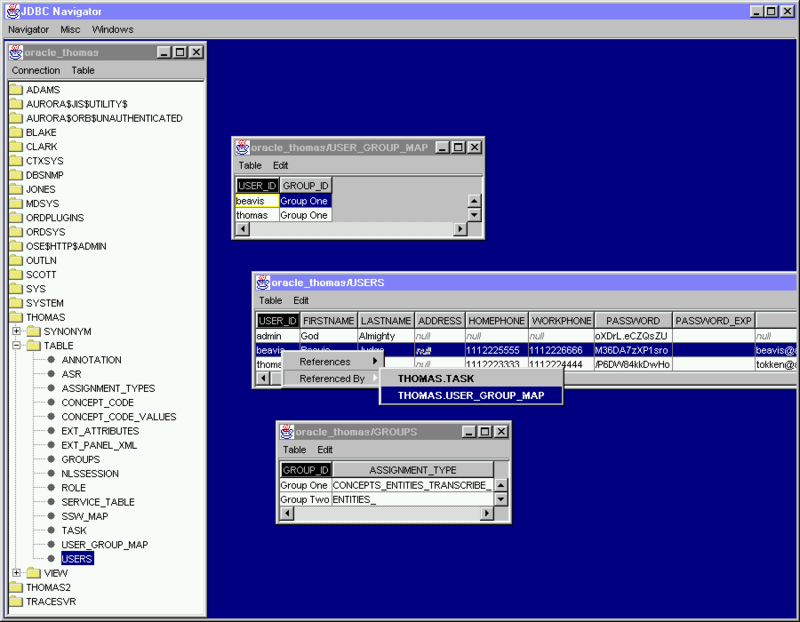 The following screen shots were taken while running JDBC Navigator under Microsoft Windows. If you run it under a different operating system, the look and feel of the user interface will be different (but the functionality, and the user interface layout, will be the same). You can select which look and feel you want to use by selecting Preferences from the Navigator menu, and then selecting the desired option from the menu in the top left corner of the dialog.